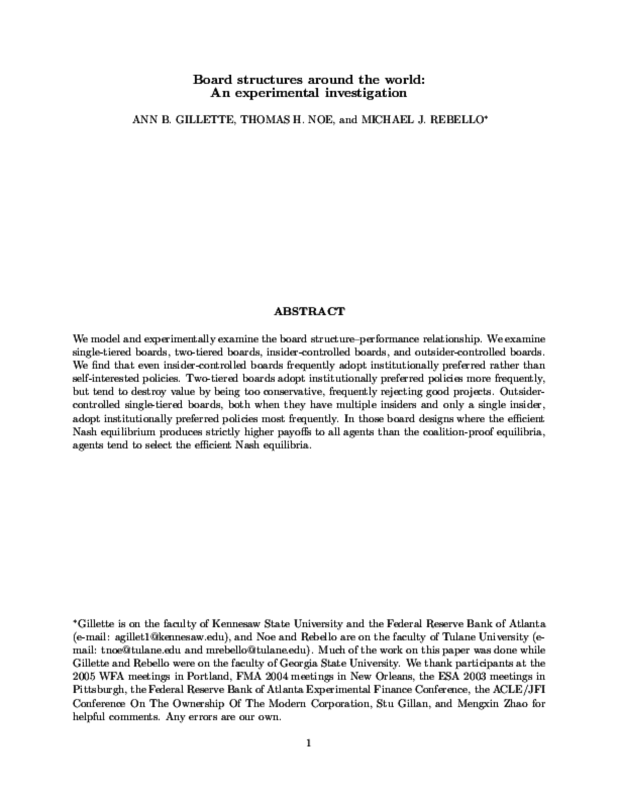 We model and experimentally examine the board structure-performance relationship. We examine single-tiered boards, two-tiered boards, insider-controlled boards, and outsider-controlled boards. We find that even insider-controlled boards frequently adopt institutionally preferred rather than self-interested policies. Two-tiered boards adopt institutionally preferred policies more frequently, but tend to destroy value by being too conservative, frequently rejecting good projects. Outsider controlled single-tiered boards, both when they have multiple insiders and only a single insider, adopt institutionally preferred policies most frequently. In those board designs where the efficient Nash equilibrium produces strictly higher payoffs to all agents than the coalition-proof equilibria, agents tend to select the efficient Nash equilibria.